Software tools for extreme productivity and high profit in modern woodworking and plastics processing. Design furniture and interior, visualize in 3D and produce at the touch of a button. Craft 4.0 or Industry 4.0: Regardless of your current machine park, we offer you the perfect software solution for furniture and interior design with F4®Solutions. Intuitively operable, F4®Design stands alone with CAD shortcuts and the ability to import 2D or 3D dxf and dwg files. The 3D planning of rooms and even floors is simple and clear. Finished design in next to no time. Elements from the limitless expandable library can be inserted into the design quickly and flexibly. Templates also speed up the creation of new drawing content and result in fast, professional designs. Design and accessory elements from the library make the drawing more realistic and your design becomes clear to your customers. With F4®Design, you convince your customers with photorealistic 3D visualizations directly from the production drawing. You present customized design options from different perspectives during your sales talk with your customer. Right from the start your customer knows what he is buying – thus, there are no misunderstandings. Thanks to its parametric structure, the implementation of customer requests and possible modifications can be done quickly, even during the sales pitch. Every single body, every single piece of furniture in your F4®Design planning contains materials, fittings or manufacturing information. 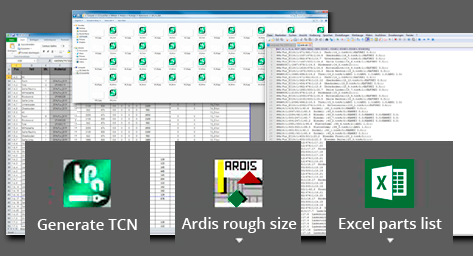 CNC programs, ARDIS transfer and parts lists. At the push of a button, cutting lists, material, fittings, and finished parts lists are created and thus made available for the future, individual production process. Benefit from the many possibilities with F4®Design. I am really looking forward to the F4-Solutions-Software, which I would like to use in my company for myself and my co-worker Phillip, in order to be able to continue to exist on the market as an established cabinetmaker without high-tech machines. F4®Guide enables work optimization with its 3 Barcode-System 4.0. 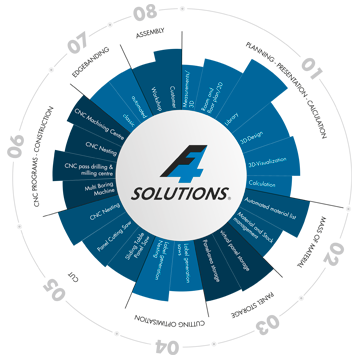 Understandable for everyone, without investing in interlinked new machines and high-tech systems, F4®Solutions makes the step towards networked production including Industry 4.0 standards affordable even for craft businesses with standard machines. As a reliable partner F4®Guide accompanies you through the entire workshop and networks planning, costing, production and assembly. From the individual piece of furniture up to the planning of entire floors: Each component gets a component label, which leads through the entire production process with cutting, special machining, mortising and edgebanding – all this directly on the machine. The 3 Barcode-System of the F4®Guide allows an overview of the production process at any time and shows all work steps. 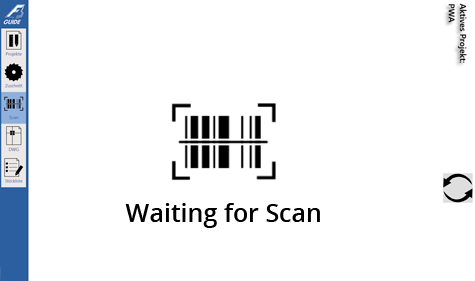 The simple scanning of the respective barcode brings the data to the F4®Guide and guides you through the further processing process with detailed drawings and 3D data. No more enquiries, no additional steps, no mountains of paperwork. Directly from the drawing created during planning with F4®Design, all necessary data for the production are generated. Turning, zooming, measuring and many other functions guarantee absolute clarity in the manufacturing process, in assembly or mounting – this is only possible with F4®Guide. All parts can be clearly identified through the combination of parts list and 3D drawing. The distinct components name makes reproduction of damaged components quick and easy. Thus, there is no confusion or manufacturing errors. Saving space, material and time the CNC cutting optimization software F4®Nest interlaces furniture and other milled parts. The result will be presented in 3D. Cutting of panel material in the nesting process is efficient, profitable and reduces cut-off. Cutout areas can be cleared for other components. The panels are perfectly utilised based on their settings and one of the most powerful 3D cores of the latest generation optimizes nesting for profitable results at the highest quality standards. The graphical representation of the finished Nest with 3D editing capability, rotation and individual assignability simplifies operation and guarantees maximum flexibility. The identification of individual parts is possible at any time and ensures constant control over the project. The manual control allows finished nests to be customised and adapted for cross-project material compositions. The manual changes of nesting proposals through adding, rotating, and adjusting new parts, allows for an optimal use of residual space. The label generator offers flexible design such as the use of any number of free space for naming or integrating images or barcodes. A database of templates and the recognition of label size directly in the printer settings facilitate and accelerate the workflow. Intelligent "nesting" of free-form parts ensures the best possible utilization of the panel. Various milling strategies and process sequences can be predefined, thus perfectly complete the individual 4.0 work optimisation. By entering just a few parameters you can design the frames and fillings of your doors and windows. Relevant parameters are for example: size, corner connections with or without glass beads, fittings and much more. With the click of the mouse, the window will be broken down in seconds to individual CNC programs. Without any extra work, the machine operator can then load these files from the production planning and run them. A material / parts list with the image of the window is generated automatically. Intuitively and quickly you plan individual windows and doors. In a few seconds the F4®Frame breaks up the design into individual CNC programs that are transferred to your CNC machine free of rework. A complete material and parts list is of course automatically generated. Counter connections with milled spigots can be produced absolutely accurately with F4®Frame and Format-4 CNC machining centres, offer exceptional stability with efficient production without dowel boring and are flexible applicable in door and window systems. Directly out of the F4®Frame, absolutely no rework necessary, in all strengths and regardless of the bar width. Why should you plan two-dimensionally when the product is three-dimensional? Impressive visuals help you plan and support your sales pitches. Whether in stairs and staircase construction, for free-forms of all kinds, rotation surface processing or 3D engraving – the F4®Solid powerd by alphacam is the perfect complete software solution for woodworking and plastics processing. Depending on your needs, you can generate 3D CAM programs for 3-, 4- and 5-axis programming just as you have designed and defined components. F4®Solid is the 3D solution for all Format-4 3, 4, and 5-axis machining centres. With the surface generator, the creation of rotation surfaces, TAB – or edge surfaces, extruded surfaces or surfaces from sections is very simple. Easily load 3D data, generate surfaces, create high-end lettering or engrave ornaments with 3D. Fully automatic creation of milling paths in the 3-, 4- and 5-axis range brings efficiency into your work process. With the integrated 3D simulation you can test prototypes quickly and easily in your office. On the machine, the finished products can be manufactured in unit number one faster. A high-quality end product and satisfied customers! The postprocessors, which are coordinated by well-known software manufacturers on Format-4 CNC machining centres, allow you to leave your manufacturing processes unchanged up to the machine. 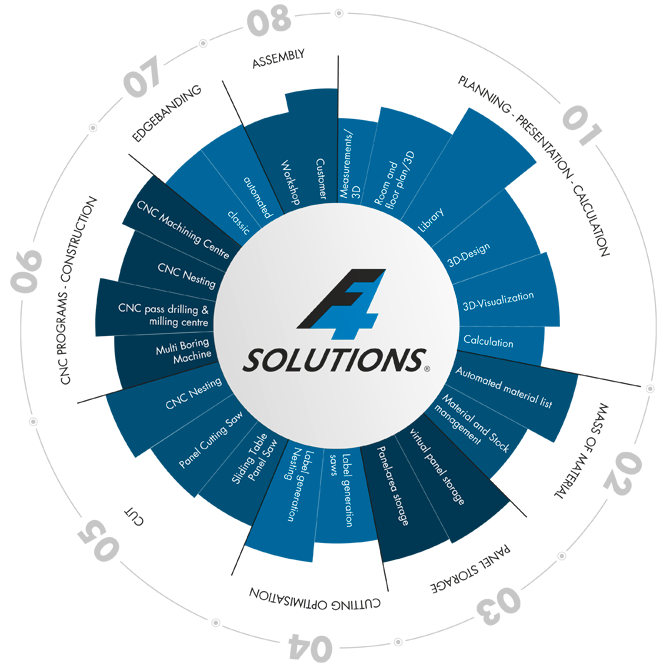 Another strength of the F4®Solutions is the seamless connection and secure compatibility with a variety of software solutions through numerous post-processors.